Liber Viaticus, the breviary of the bishop of Litomyšl and Olomouc Johannes Noviforensis, is one of the most significant manuscripts of Bohemian book painting. As the name of the commissioner on individual open double pages is complemented by the office of the bishop of Litomyšl, the codex was written between 1353 and 1364. It contains texts typical of a breviary after the middle of the 14th century; at the end of the manuscript, however, it is complemented by a part of the Legend of St Sigismund, a letter of Pseudo-Dionysius the Areopagite on the martyrdom of Saints Peter and Paul and, in the last quire of the manuscript, added slightly later, the office in honour of the Lance and Nails of our Lord and the legend of St Wenceslas Crescente religione christiana, written by Charles IV. The codex is placed in the National Museum Library under shelf mark XIII A 12. The illuminator, whose name is unknown and who is thus referred to as the Master of Liber Viaticus based on this most remarkable work of his, influenced book illumination on the European level as well. 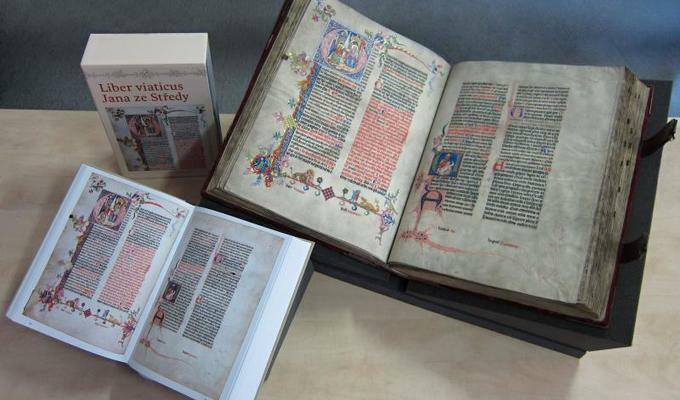 Nevertheless, the current reduced facsimile edition of the manuscript and the accompanying commentary volume is the first monograph to deal with the codex and explain its origin and meaning from various aspects and in different contexts. The introductory study by I. Hlaváček provides a general overview of Czech libraries in the period of Charles IV. The figure of the commissioner, Johannes Noviforensis, who, besides his ecclesiastical career, also achieved the significant position of a chancellor at the court of Charles IV, is dealt with by M. Bláhová. The study by M. Dragoun brings a codicological description of the manuscript, complemented by a detailed description of the binding by J. Tomšů. A greater part of the commentary volume is devoted to the decoration of the codex: its iconography (H. Hlaváčková), ornamentation (V. Kubík), its placement in the context of book painting and its influence on other illuminators (P. Brodský), and the interpretation of one of the initials (J. Homolka). The volume also contains the results of the material and technological research into the manuscript (M. Ohlídalová and J. Dřevíkovská). Based on the evaluation of the codicological context of the manuscript as well as the work of the Master of Liber Viaticus, the authors of the respective chapters of the book date the origin of the manuscript to the last years of the above-mentioned time span – to the years 1363–1364 or 1361–1364.